Soooo…tomorrow is the first day of June. How?! Somehow we’re almost halfway through the year and I still feel like the year just started, lol. 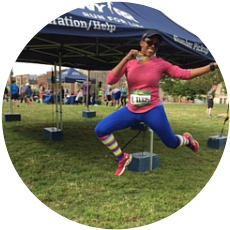 May was an important month for me as I finished training for the AirBnB Brooklyn Half Marathon and started training for my goal Fall race, the Chicago Marathon! I’ve got a few goals for June – let’s discuss! Ha! This gets a big F. I was no where near a course PR. In fact, it was one of my worst half marathon times ever. In case you missed it, here’s a rundown of what went wrong on raceday. I’ll give myself a B on this one. I was hoping to get to Barre 4 times during the month but only managed to go twice. I get an A+ for this one! I’ve really been paying close attention to hydrating all throughout the day – not just when working out. This honestly comes down to not being lazy after my runs, lol. While I always do a quick stretch post run, I really want to establish a a good 5-10 minute stretching routine that focuses on my IT band, glutes and hamstrings. This will hopefully keep me in fighting shape as my mileage begins to increase week after week. During this marathon training cycle I am going to be open to trying out new fueling products. Some brands on my list include Generation UCAN, Huma, Vega and Tailwind. Nothing wrong with my trusted brands (Honey Stinger and Nuun), but I just want to see if there might be better options out there for me. Also after my GI issues during my last race, I think it might be time for a switch to something new. If you have any experience with any of the brands I listed, I would love to hear about it! I have a few running books just sitting on my bookshelf and collecting dust and I plan on changing that this month. The Inner Runner and Racing Weight are two books that I’ve been meaning to read for a while, so I think I’ll select one of those to read this month. I’ve heard that both are really good reads! Do you set monthly fitness goals? Do you have any goals for June? I’m linking up with Annmarie from The Fit Foodie Mama, Jen from Pretty Little Grub and Nicole from FitFul Focus for Wild Workout Wednesday. Last, but not least, I’m linking up with Ange and Carmy for their Monthly Goals linkup! I really cant believe tomorrow will be June! Your goals sound great. Its always good to set yourself up for a strong marathon training cycle. Let us know how you like the books if your read them! It’s crazy right?! I feel like I have a much better base going into marathon training this year versus last year so I hope that leads to a positive outcome! I think it’s just so easy to end the run, eat and re-hydrate and forget about stretching! I’d still love to send you some Tailwind! PM me if you want! Seriously, how did it get to be June already? I’m a nuun girl, but I’ve been happy with it so no changes necessary. I usually use GU for my gel, or the one I make myself, which I love but does take planning ahead! ? I love that you make your own gel – that’s something I should look into! But seriously, how is it already June?! Love your goal of reading a running related book, think I might add that to my goals too! Isn’t this the fastest year ever?! It’s really crazy. I was planning on starting a book over the long weekend, of course that didn’t happen! The hydrating is a good goal and one that I should work on, too! Good luck with the stretching, that sounds like a really important one to me. Do you foam roll? I’ve been concentrating hard on stretching my upper back to keep the strain off my low back. I neglected stretching my legs and that plus training caused a big flare of patellofemoral pain. Three weeks off, though, and I’m good. But gotta keep up on ALL the stretching this time. Takes me quite a while, not 5 or 10 minutes but at least half an hour. hydrating is so important, especially in the summer! I love water, I just have to remember to drink it more throughout the day and not only when I am working out. I do foam roll although not as much as I should! Try the Tailwind! I love it! My goal is to crush/survive the Utah half! No pressure with my coach meeting me there- LOL! Good luck with your June goals! Wendy is going to send me some Tailwind to try – I’m looking forward to it! I have no doubt that you will enjoy the Utah Half race! Great goals! I really need to work on stretching after a run too. It’s so easy to just end our run and go about our day, but the stretching is so important. It’s something I really need to work on more! I often don’t stretch after a run — which is really the perfect time! I’m usually hurrying to get home to let the dogs out, or need to walk them . . . or rungry and must eat NOW!!! LOL. Sometimes I do. I’ve been trying to foam roll after the run more often too — not that you can’t do it later, but it’s so easy to let it get away from you. Both of those books have been on my radar for a while. I like your goal of reading a running book this month. I might have to make that a priority when we go on vacation in August. I love taking the time to read when I’m on vacation! Here’s my two cents on Huma and Tailwind. Huma tastes DELICIOUS. I love it. Buuuuuut, it goes right through me. I had a not so good experience with it last fall. So Huma’s out for me! I have some if you want me to send it your way! Tailwind is great but I had to eat with it. A lot of people do really, really well with just Tailwind and nothing else. But my tummy rumbles! I liked it, though! Those all sound like great goals! I’m sorry I missed your Air BnB recap – I’ll be sure to read that soon! 🙂 Good luck with Chicago training! Great job on meeting your hydration goals…it’s something, right? I’m running Chicago again this year as well. Just now starting to think about training plans. My only goal ever is to finish! All good goals! I’d love to add more Barre to my routine and yes, keeping up with good hydration, even when it’s hard is a must!! Definitely! I’ve noticed that I have more energy when I am hydrated. Love the reading goal, too. I haven’t read a book in over a year. What?! Yeah. It’s sad but true. Thanks Clarinda! I’m still working on the post-run stretch routine but hope to have it finalized by this weekend. I also haven’t read a book in a while – it’s quite sad! I can’t believe it is June already! You have some great goals for the month! I need to estabslish a post run stretching routine myself. I know, this year is just flying by! A few minutes of stretching after a run seems to really make a huge difference for me 🙂 My hammies can be quite cranky! Setting monthly goals is a great idea…I am going to try to run 4 hours a week in June. I usually switch to time instead of miles, because I slow way down! My hammies were very cranky after my last half marathon so that just lets me know that i need to stretch! You have some great goals for the month, I’m still finalizing mine! I think testing out different fuel is a smart move. My friend loves UCAN but I’ve never tried it…Clif Shot Bloks were great and I never had GI issues using them – they’d just get stuck in my teeth, smh. I think I tried Clif Shot Bloks many moons ago but I don’t remember if I liked the or not, lol. Might be smart to give them a try again. It tends to be the last thing on my to do list, but I know it’s a necessity! It is so hard to stretch after a run. I just want to eat or shower after my run. With the UCAN you can also make your own gel. Check out Elizabeth Clor’s site for information. Me too! I always want to shower immediately because I feel so gross. I will definitely check out Elizabeth’s website to learn how to make UCAN gel – thanks! Great goals… I always find that I do better at stretching/rolling when I make it a goal, otherwise it seems to fall by the wayside (which I don’t know why, because it always makes me feel so much better when I get it done). I made the switch from the honey stinger gels (which I loved, they just felt to heavy) to huma (they taste great and aren’t as heavy). I’m also mixing it up a bit with some “real food” fuel… goldfish pretzels, which is a nice change from all the sweet. I hydrate with Nuun … and I’m really liking the nuun performance for my long runs. I think I will try some “real food” as fuel as well. I know many runners have had success with pretzels!